I was putting some stuff in my semi-defunct van (I’m going to drive it around town until it drops since I filled the tank just before I was told it needed an immediate transmissionectomy) when Mother called me to come over. She was transfixed (my van could be transfixed, Honda says, for about five grand) by a black and yellow butterfly. It’s an Eastern Tiger Swallowtail, a common species in the area. If I’m reading correctly, it may be a female because of the blue markings on its wings. Males are typically all black. It doesn’t make much difference to me, although I guess another Eastern Tiger Swallowtail might care. I’m kinda “don’t ask, don’t tell” when it comes to the insect world. I posted a photo of a conglomeration of butterflies at Trail of Tears State Park earlier this year. I’m told that “conglomeration” isn’t the correct term for a bunch of butterflies getting together. Such a gathering is a rabble, swarm, kaleidoscope, flutter or rainbow, depending on whether the namer had access to a thesaurus. A group of moths is called an “eclipse,” in case you were wondering. Their press agent isn’t as good as the one used by the butterflies. If you notice new postings being light or non-existent for the next couple of weeks, it’s because Wife Lila and I are headed up to the Seattle area where temps are in the mid-40s. The temperature doesn’t have anything to do with the dearth of postings; I just like to say mid-40s after baking in Cape for a month. Because of the van troubles, I’m leaving my bike and all my computer gear except my laptop in Cape. As soon as we get back from our vacation, I’m going to have to hop in her van and come back to pick up all my stuff. I’m trying to get a few days ahead, but I’m not going to be able to get three weeks of content in the bag in the next two days. You may get to see a bunch of West Coast pictures while we’re out there. If they aren’t your cup of tea, come back in a couple of weeks. I won’t take attendance and there will be no tests given covering material posted while we’re on the road. Enjoy your vacation with your wife! If the van wasn’t already shot, we would shoot it…..have fun! I love the Seattle area. I have a branch of my dad’s family who love there and have visited many times. I would love to see some pictures! 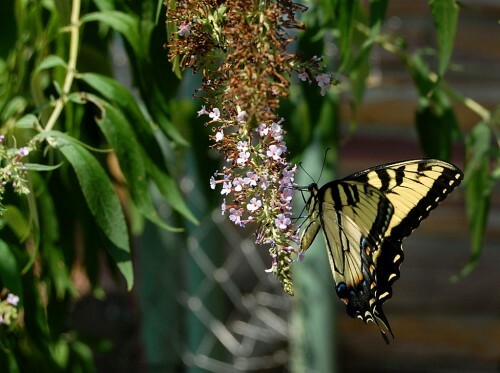 Butterflies are free to fly…fly away! I truly believe that the Jackson, MO school district should change the name of their mascot to Butterflies from Indians…in honor of all Native Americans! I cannot wait till our Cape Central Tigers play the Jackson Butterflies this fall in Football. Cape Central Class of 1978…and Darn Proud Of It! I saw it from the Interstate yesterday, but didn’t go by to see it up close. I’ve been spending most of my time in Perry County and the Bootheel this trip. Maybe next time I’m in Cape. will miss the usual insightful! postings but Seattle does sound inviting. – we would like to escape this perpetual 102-106 summer in Wichita, too. Have a safe fun cool trip. A cycling tourist from up in Oakland, OR, posted to a bike list that his arms and legs are just now tanning because he’d been wearing leg warmers and long sleeves until early July. I hope I’m not trading melting for shivering. Ken, as talented as you are and since you will be taking pictures, I’ve always wanted a seascape and you would be the one to do it. When we were out in the Los Angeles area long ago I saw this awesome seascape at the Laguna Arts Festival….couldn’t afford it and always regretted not coming up with funds to buy it. I’m still looking for a replacement. Take a look at these beach shots from sunrise on New Year’s Day. Wife Lila’s the beach person. I’m a river person. Come on over to other Washington (Wine Country)when you get through with the nasty Seattle weather. Stop by and say HOWDY and I’ll treat ya’ll to a couple of glasses of the best Merlot in the entire country! Wife Lila is in charge of all touring arrangements. Since I’ve been in Cape for the last month, I am completely divorced from all planning of the trip. Now to mention it, the word “divorce” did come up when she pointed out that I’m supposed to be back in town in time to leave for Seattle. Enjoy your western adventure, tell mom I bought 4 quarts of blackberry pie mix and one has her name on it. I would take her a piece of the pie I made Friday but ‘mad-dog’ and I finished it off today. Have a safe trip, Ken, and stay cool! There’s no cooling in sight for us, here in SE Missouri. Dowm to 97 yesterday. That’s an improvement over 102, but not much. JD picked up 4 quarts of homemade blackberry pie filling at the Mennonite’s nursery in Aquilla–and one of the jars has your mother’s name on it! We’ll see about getting it to her soon. 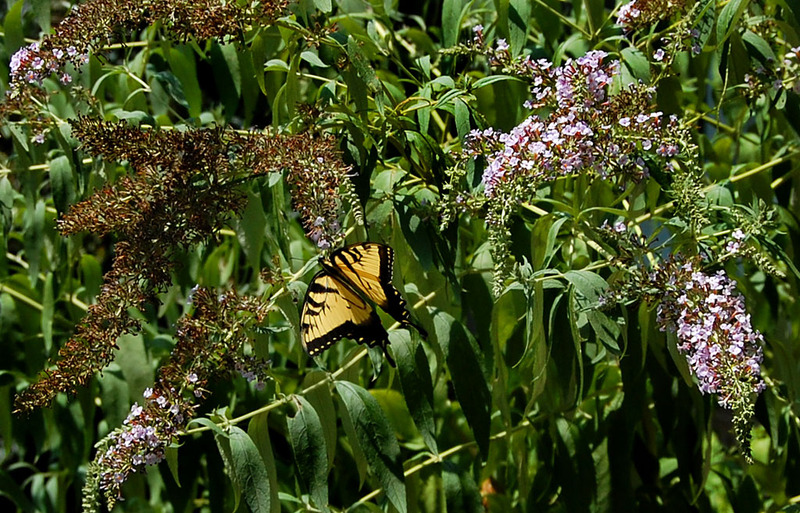 The Tiger Swallowtails are lingering longer here, too, I notice. I was able to shoot a dozen or so close-ups the other day. I think the heat is wearing them down!